As I was hiking back in the darkness from an evening sit, my headlamp caught something bright at 25 yards. 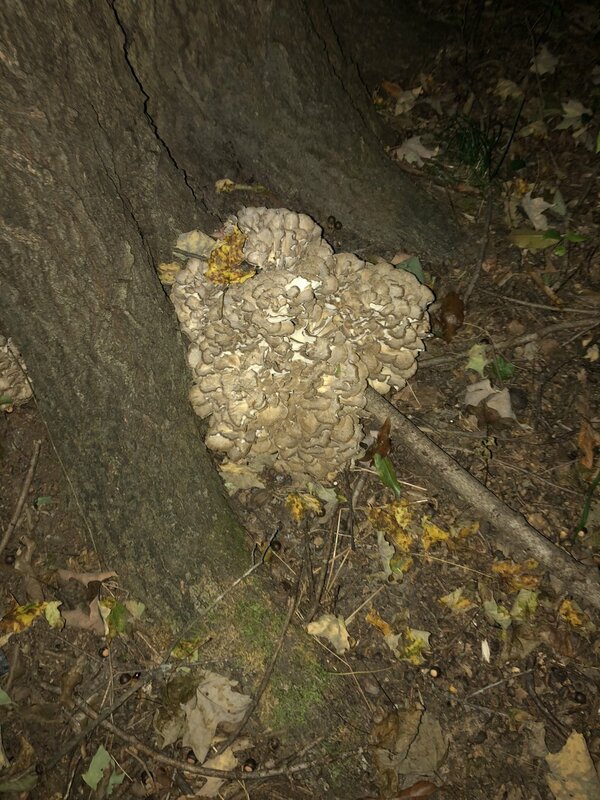 Upon further inspection, I plucked the 15 pound Hen-of-the-Woods mushroom from the base of a big Red Oak. I strapped the whopper onto my backpack, which was full of camera gear, which was also strapped to my stand and sticks. I made it about 50 yards before I spotted another very fresh Hen, which I gladly picked and tucked like a football under my arm. A half-mile later, I was back at the car. The shrooms were riding in the front seat. As I putted home, happy as could be, I started thinking about non-traditional ways to use this mushroom. Hens have an earth and somewhat savory flavor. Stroganoff, cream of mushroom soup, or simply sautéed are what I have traditionally done. They also freeze extremely well, and when vacuum bagged, they will last about a year in the deep freezer. Lastly, they have well-documented health benefits (google search Maitake). So, I decided I would try breakfast burritos. This is a “meal-prep” recipe that I threw together, and could be modified in many ways to fit your taste. The mushrooms will provide a nice rich earthy flavor, the rest of the ingredients are truly up to you. I went with a Denver omelet style burrito with some chorizo to give it some heat. 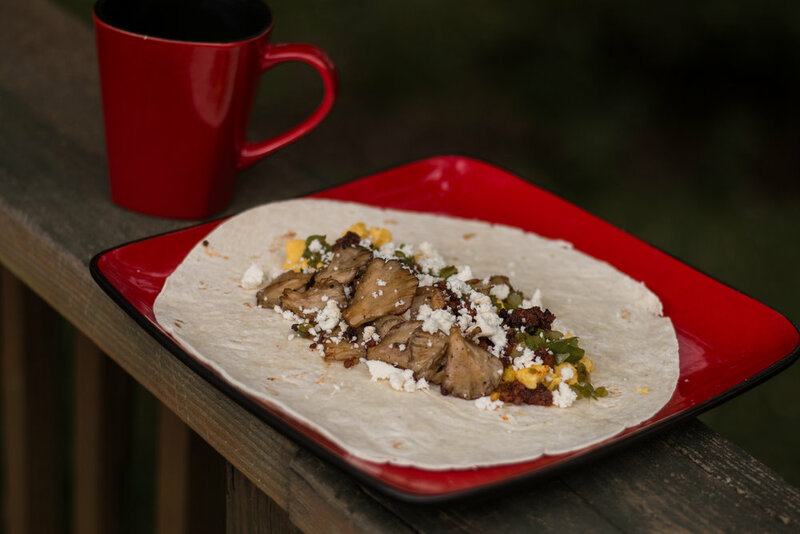 These can be heated in a few minutes for a grab and go style breakfast, perhaps enjoyed while you’re loading the truck up for those early-morning rut hunts! Makes 12 large burritos or 24 small burritos. Start by prepping your ingredients. For the mushrooms, I prefer to tear the “feathers” apart and batch rinse for dirt, bugs, and leaves. I then cut the larger feathers cross grain into smaller pieces. Small pieces stay whole. Eggs are cooked in batches of 10, scrambled. A food processor does a great job at dicing peppers and onions. Cheese is simply crumbled, this can be done during assembly. Fully cook your meat of choice. I strain the grease from the chorizo. Start cooking eggs as your meat is browning. Scrambled eggs are as simple as can be, try not to overcook these. Sauté the onions and peppers in a couple tablespoons of butter. Cook until onions are translucent and tender. For the mushrooms, melt a few tablespoons of butter. Throw a few handfuls at a time into the pan, careful not to overcrowd the pan. Saute these on medium high heat. You will notice that the mushrooms will release quite a bit of liquid at first. Cook until the extra liquid is gone and the mushrooms have slightly crispy edges. Enjoy a few of these in their full glory while you prepare for assembly. Begin assembly. I find it tough to judge the correct amount of filling, but you will figure it out. When rolling, tuck the ends to seal in the goods. Dab some butter or oil on the seam for a quality seal. Place assembled burritos seam-down on a lightly greased cookie sheet with the outsides not quite touching. Bring your Green Mountain Grill to 300 degrees. Add your cookie sheet of burritos and cook for 10-15 minutes. Your burritos should now be slightly crisp on the outside with a nice seal on the bottom. Go ahead, eat one of these smoky delights. You could also reproduce this in the oven, but it just isn’t quite the same without the smoke from a Green Mountain pellet grill. Lastly, after your burritos have cooled, they are ready for freezing. I wrapped them in plastic wrap, put them in a 1 gallon freezer bag, and dropped into the freezer. A vacuum sealer would do a great job as well, just be careful not to break the shells when sealing. Enjoy!